Driving back from Austin where I attended the Frank Webber lectureship, we decided to return via LaGrange. I had hoped to find some bluebonnets in bloom—and there were a few—and then I spied the courthouse and decided to take a turn around the block and get some photos of it. I parked in front of the Prosperity Bank on the square and …………………. What a surprise to see a wall mural of quilts! And a gazebo. And a nice garden with a few blooming lilacs and smiling violas. The museum itself is an old building from the late 1800’s that has been beautifully restored with original wood flooring, original bricks and stone walls, and hand-carved posts. On display is a selection of quilts from Karey’s last book in the series of best Texas quilts—and I have a piece included—which was hanging on the wall. There were about a dozen people touring including a young couple and some husbands who also walked about and inspected the quilts with interest. The tour guide was enthusiastic; the little gift shop area nicely arranged—and I must agree with the tour guide—the museum is very tranquil—she thought it was like a church with the quilts serving as stained glass windows. 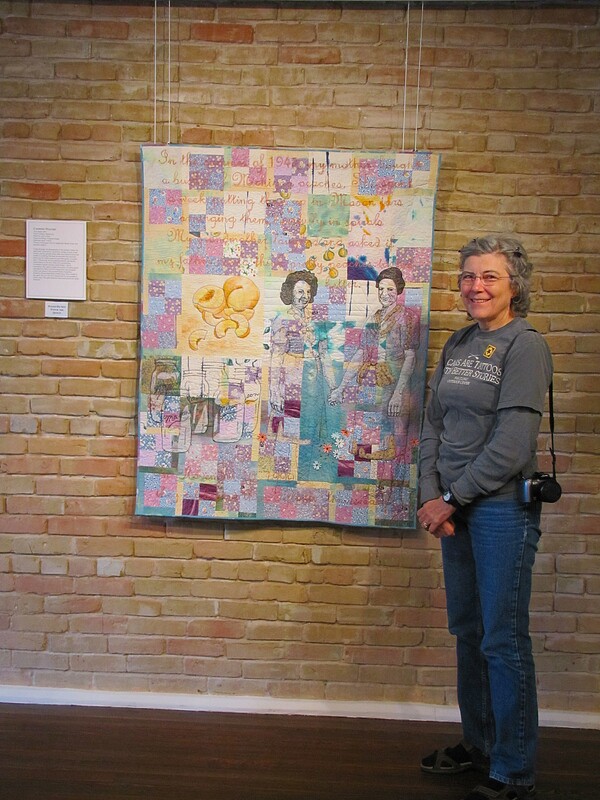 Yes, that is me–standing next to my quilt ‘Canning Peaches’; photography is only allowed by quiltmakers/artists—maybe I should have spent a bit more time on my hair that morning and chosen a different shirt (scars are tattoos with more interesting stories) but you see me as I am! And congratulations to me–I used a photo from smugmug rather than going through the process of changing image size and so forth–but we’ll see if I can do it again.